In the past two decades, we have seen an unprecedented rise in greenhouse gas (GHG) emissions which are wreaking havoc on our planet. Globally we are seeing increases in temperature, more extreme weather events, artic sea ice melting, impacts on seasonality and biodiversity, to name a few. A large contributor to these emissions are fossil fuel burning, as well as land use change, as we try to accommodate the housing, fuel and food needs of an increasing global population. These two issues have the potential to be addressed by utilising bioenergy. Dedicated, second-generation bioenergy crops offer the opportunity to minimise land use impacts (due to their ability to sequester CO2 quickly) and to offset the use of fossil fuels. In order to limit global temperature rise to between 1.5-2°C, IPCC modelling has shown that we need to achieve net negative emissions as soon as possible. “In model pathways with no or limited overshoot of 1.5°C, global net anthropogenic CO2 emissions decline by about 45% from 2010 levels by 2030, reaching net zero around 2050…. All pathways that limit global warming to 1.5°C with limited or no overshoot project the use of carbon dioxide removal (CDR) on the order of 100–1000 GtCO2 over the 21st century” Quote from IPCC SR15. The “most favourable” technology that is selected by Integrated Assessment Models (IAMS) is BECCS – Bioenergy with Carbon Capture and Storage. In order to have BECCS deployed on a scale which will be meaningful in achieving negative emissions, bioenergy feedstocks will need to increase, resulting in potential massive land use change. “Large-scale, deployment of BECCS and/or AR would have a far-reaching land and water footprint (medium evidence, high agreement)” Quote from IPCC SR15. So what is ‘vertical farming’? Vertical farming is a term used to describe indoor, controlled environment cultivation which exploits vertical space to grow crops. Essentially, growing things in stacks or layers. This technology has several names associated with it such as: ‘indoor agriculture’, ‘Controlled environmental agriculture (CEA)’ and ‘Plant Factories with Artificial Light (PFAL)’, as well as others. 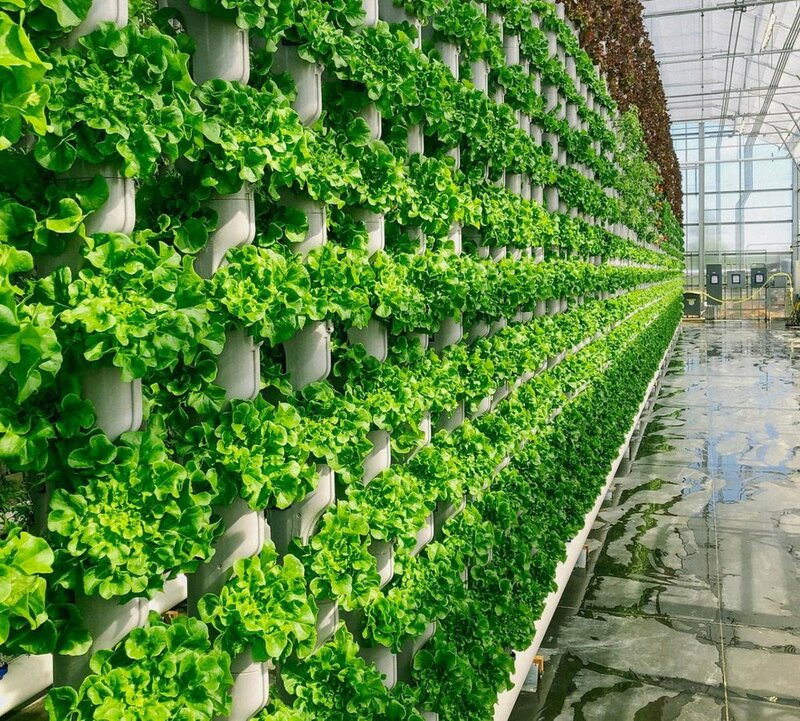 Vertical farming takes place in a controlled environment where all conditions required for growth are supplied, including: lighting, water, nutrients, with environmental conditions, such as temperature, humidity and CO2 concentration, all closely controlled. This allows us to provide optimal conditions for plants to grow which has been shown to reduce water/nutrient consumption, increase yields and reduce time to harvest relative to traditional outdoor cultivation. The majority of these systems use hydroponics – this is a type of soilless cultivation method where the plant roots are exposed to a water and nutrient solution, either directly or with the plant suspended in an inert media, such as perlite or gravel. 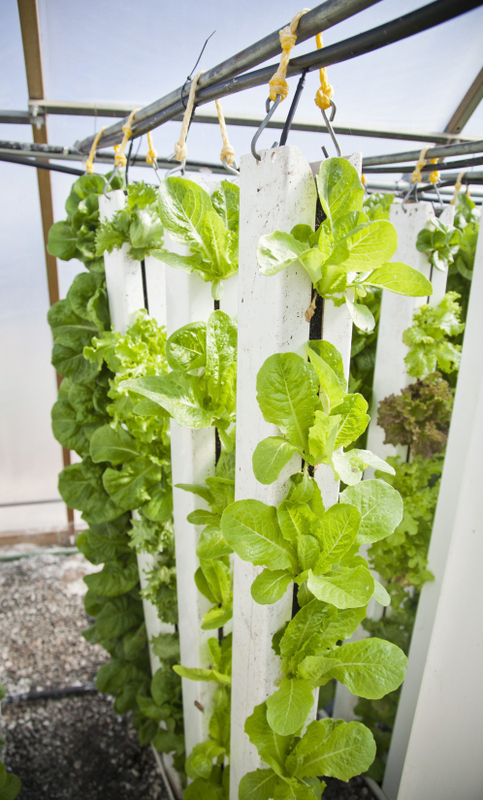 At present, vertical farming is being used commercially; the investment and number of operations is increasing globally. In 2017, $1.5 billion was invested into agricultural technologies (AgTech), including controlled environment agriculture (CEA), the highest investment in this area seen to date. In 2018, industry leaders, Plenty, received a $200 million investment from Japanese tech investor SoftBank Vision to expand operations into Asia, with over 300 indoor farms planned. Due to the high capital and operation expenditure, the only crops which are being commercially grown in these systems are leafy greens, tomatoes, flowers, herbs and microgreens, due to their high retail price. Vertical farming offers the opportunity to obtain more biomass per unit area compared to traditional farming, therefore reducing the land footprint of expanded biomass production. Future demand for BECCS technology, and therefore biomass feedstocks, offers an opportunity to investigate the feasibility of cultivating bioenergy feedstocks in vertical farming systems. We know that vertical farming “works” for small crops, but how will it perform for larger staple crops like maize or wheat? What about second-generation bioenergy crops, such as Miscanthus or SRC willow? My research focuses on technical, environmental and economic feasibility of cultivating bioenergy crops in vertical farming systems. Initial investigations which looked at modifying existing infrastructure designed to grow lettuce, suggest that it will be technically possible but economically and environmentally challenging. The next step in my research is to understand the conditions required to make the technology work, such as using renewable energy to power the farm or policies that will mean the price of the feedstock is more favourable for the economics of the system. URBAN AGRICULTURE: CAN IT FEED OUR CITIES?